The usage of rugs certainly makes the living room in your house much cozy and comfortable. You may have it anywhere though; it can be your bedroom or your living room. The warmth that it gives to your feet is unmatchable. Not only that, it greatly improves the aesthetic look of the house as well. It is certain that these rugs would get dirty because of the everyday use. This is the reason why they need regular cleaning. Regular vacuum cleaning is something you can take care of yourself but for a specialized cleaning you need a professional cleaner. Our agency is called Cleaners Putney and provides professional rug cleaning services in Putney, SW15 London. 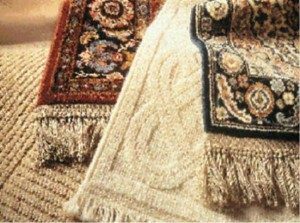 Just call us and hire our professional cleaners to deep clean your rugs and carpets. Initial step of cleaning is a general vacuum cleaning followed by a deeper level of steam cleaning with the use of hot water extraction. It helps to remove the deepest of the hidden dust within. This method is considered ad the most advanced one in order to clean carpets, rugs and upholstered furniture. With the help of this advanced technology your should not have to wait for days to get the rug completely dry. Today many companies are using solutions which are biodegradable in nature. It ensures that there is no damage done to the rug. So irrespective of the size of your rug we follow the same process to clean them and the result is always the same. With this cleaning solution your rug is set to look as new as ever. Therefore it is recommended that you use our professional cleaning solutions as cleanliness and your satisfaction is what we believe in.